Our next exhibition will be at the Pentecost Festival in which the Run with the Fire digital exhibition will be shown alongside original artworks from commission4mission artists and invited guest artists. 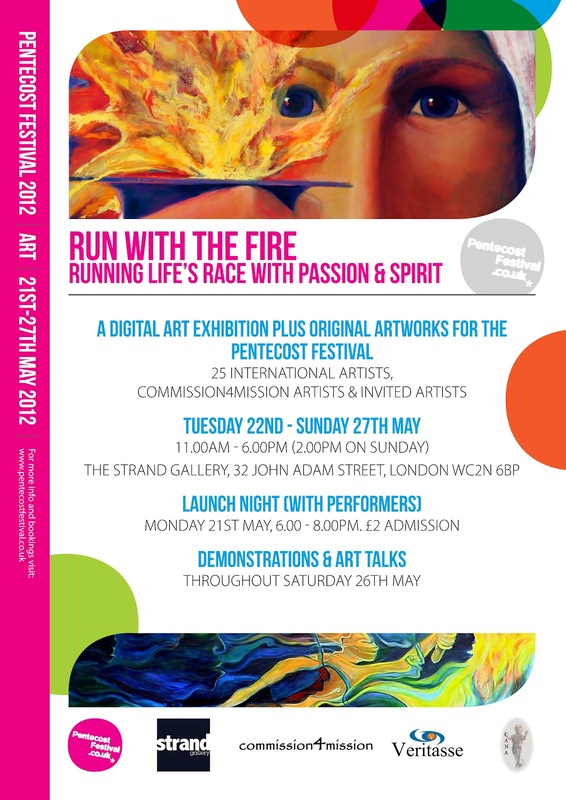 The Run with the Fire exhibition will take place at the Strand Gallery (32 John Adam Street, London WC2N 6BP) from 22nd – 27th May, 11.00am – 6.00pm. Including an eclectic mix of styles and media, this will be a stimulating and exciting show exploring the broad theme of running life’s race with passion and spirit. Featured artists include Harvey Bradley, Colin Burns, Christopher Clack, Elizabeth Duncan Meyer, Robert Enoch, Jonathan Evens, Christine Garwood, Jim Insole, Ken James, Miriam Kendrick, Mark Lewis, Glenn Lowcock, Henry Shelton, Sergiy Shkanov, Joy Rousell Stone, Esther Tidy, Mike Thomas, Rachel Watson and Peter Webb. A Launch Night on Monday 21st May, 6.00 – 8.00pm, will provide the first opportunity to see the exhibition and will also include music and poetry exploring the exhibition theme. Those performing include singer-songwriter and poet Malcolm Guite, artist-musician Colin Burns, artist-poet Jonathan Evens, musician-poet Steve Scott and performance poet Tamsin Kendrick. Refreshments will be available. Cost – £2.00, pay on the door. Painting demonstration – Harvey Bradley, ongoing throughout the day. See Harvey work on a painting and discuss his approach with him. The Spiritual Image in Modern Art – Mark Lewis, 11.30am. A broad overview of the spiritual impulse in the art forms of the modern world and their potential to turn our minds to higher things. Run with the Fire – Steve Scott, 12.30pm. A talk about the ‘Run with the Fire’ project and DVD. th Century painters. The main themes include Spencer’s time as a war artist, and his extraordinary paintings which envision the Christian Gospels played out by the people in his beloved home town of Cookham. Praying with our eyes open – Glenn Lowcock, 3.00pm. A talk on using images as an aid to prayer. Emotional Tourist – Steve Scott, 4.00pm. What I am learning about art, life, spirituality, Trinity, and relational aesthetics from my travels in Bali and elsewhere. Christian influences on modern & contemporary art – Jonathan Evens, 5.00pm. A broad overview of modern and contemporary art and artists which engage with Christianity. See http://commissionformission.blogspot.com/, http://www.pentecostfestival.co.uk/home/, and https://www.proudonline.co.uk/exhibitions.aspx for more information. Copies of the Run with the Fire DVD can be purchased via http://www.veritasse.co.uk/cards-prints/most-popular/run-with-the-fire-dvd-pack/ or at the exhibition. A preview of the Run with the Fire digital exhibition can be seen at http://youtu.be/nFBGZDgFaw4, while for up-to-date news of the project see http://runwiththefire.blogspot.com/. Valerie Dean works in acrylics and her technique is usually to put materials and colours on canvas or board, to see what emerges. It is a dialogue between the artist and her materials. Because of her background, this often consists of figures around a religious theme. They just appear! Very often, people seem to want to appear in her paintings, a little like the pictures in the fire that she used to see in her childhood. At other times, she finds that buildings and places she knows inspire her.